Playing the tourist…being the tourist… has never really been my cup of tea, but for this trip I decided to try at least one day. This being my first time in the City of Love, I decided to give touristing in Paris a shot. It wasn’t on Thursday, the 9th, however. 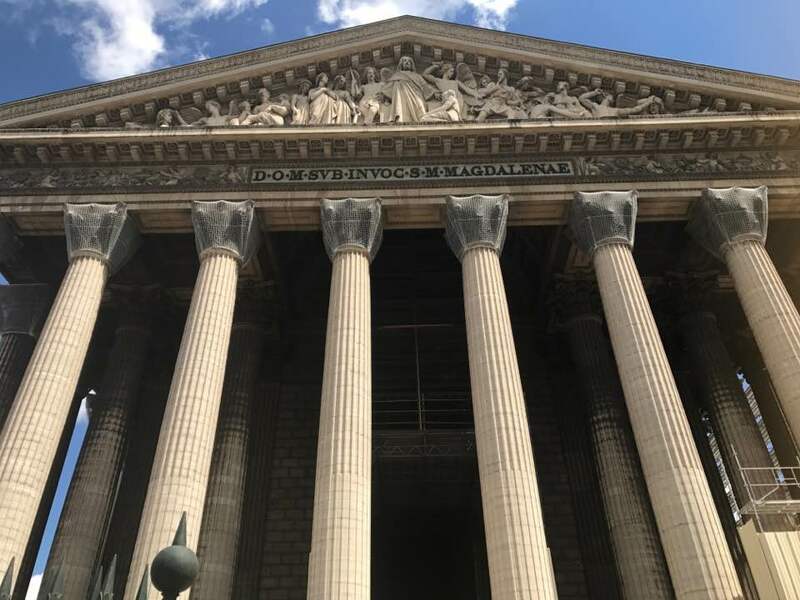 That was my birthday and I honored that occasion by going to the Eglise de la Madeleine, meditating, “chatting” with Magdalen and Sainte Rita, and then heading back to the hotel alone to record a sounding with the Super Full Moon in Sagittarius energies. Then from across the church I could feel a very strong pull. 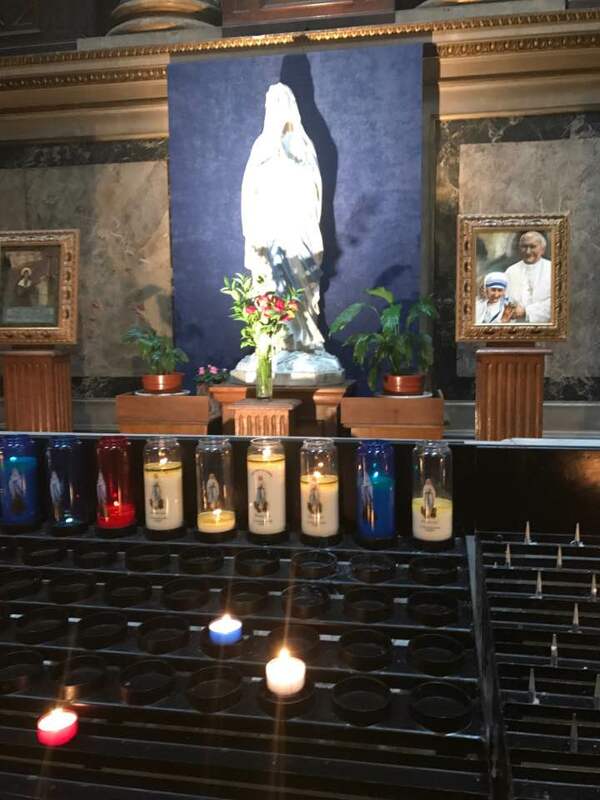 When I first looked I thought it was a statue of Mother Mary, but when I approached, I discovered it was Ste. Rita of Cascia. I lit a candle to her and she very quietly told me she would help me with my deepest wishes. Her kindness, sweetness, and love completely washed through me. The sounding that I created later was very soothing and sweet, but my personal experience of the Sagittarius Full Moon energies was anything BUT that. I would have to say that the sounds coming through me were sent as an antidote to the craziness most have been feeling coming into this Full Moon, especially me. Click here to listen to or download the Sounding. So Friday, June 10 was Tourist Day. Laura had purchased us tickets on one of the open air buses that goes all around the sites near the city center—one that you can get on and off of all day. We stopped first at the Louvre– walked around the open courtyards. Next, on to Notre Dame. We had a brief thought of going inside, but the lines for tickets were formidable. Next my favorite part, a long and relaxing lunch at a street café just across the street. Salmon kabobs with sauce citron and of course a glass of red wine. Once we re-boarded the bus it was on to Le Tour Eiffel. 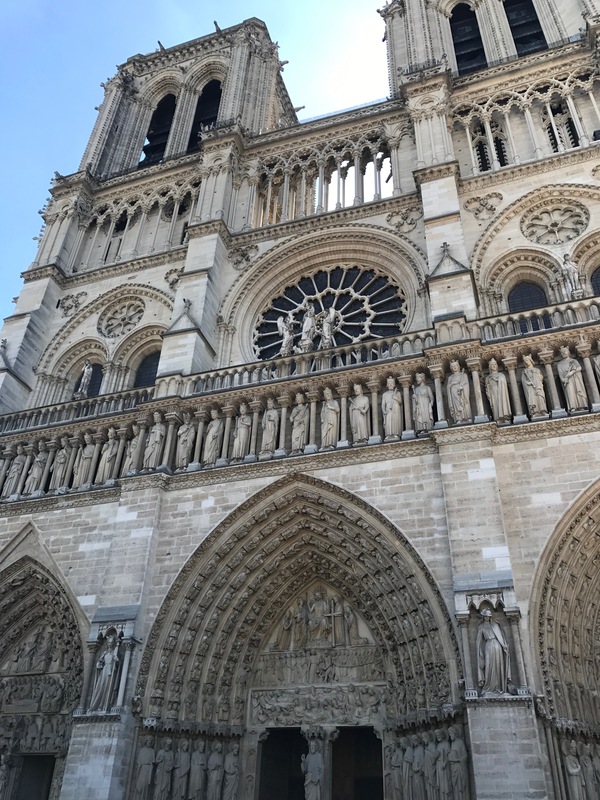 Oh my, the crowds and lines at Notre Dame were nothing compared to this place. If one wants tickets to actually go inside and experience any of the sites, one must plan ahead and purchase reservations and/or tickets online ahead of time. We had not. 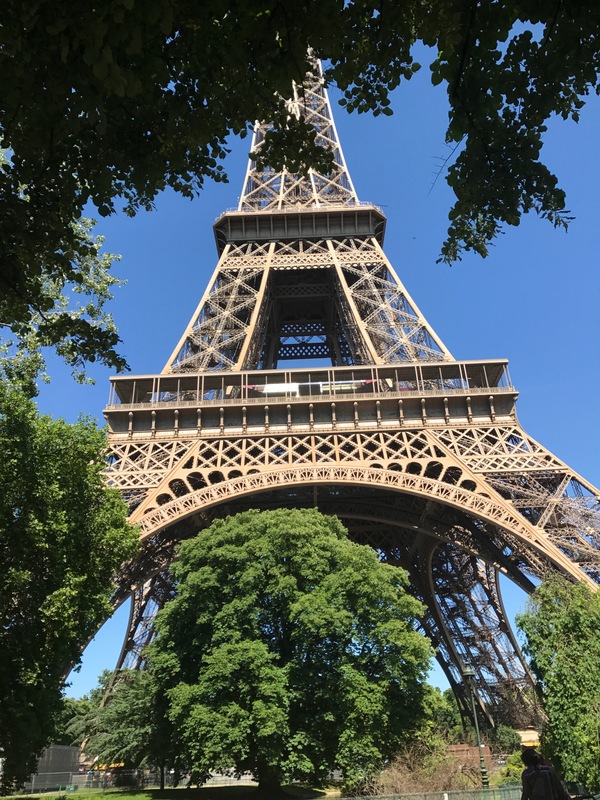 We finally found a way to maneuver into a small park to the side of the Tower by hopping over a couple small fences, then finding a lovely bench in the shade to gaze up at the amazing structure. “C’est tout” for me…by then I was exhausted from being around so much people energy all day. Back to our original place of departure by The Opera and then the walk back to the hotel. But not so simple as it should sound. The GPS on Laura’s phone just kept sending us around and around in circles and with very few of the streets in Paris being at right angles to each other, my own personal, very meager inner-directional tracker was very much below zero. Finally, two darling angels on the back of a scooter stopped and asked us if we needed help. Merci, merci…they pointed us in the correct direction and gave us specific street names to look for. We finally made it back to familiar territory and the hotel…exhausted from a hard day of being the tourist.